In what may have been my last weekend of games with Eric before he leaves, we played a whole bunch of games in the span of 12 hours. There were a lot of new games played and I'll try to cover most of them in 2 posts. This first post is for the bunch of smaller games we played; though they were small, did they pack a punch? Let's find out! First up was a print and play that Eric made - Yardmaster Express. I had my eyes on Yardmaster when the game was up on Kickstarter, but in the end I had decided that I would wait for its release to see if it deserves the buzz it received during the campaign. I had completely brushed aside Yardmaster Express since I was waiting for Yardmaster. Yardmaster Express is a very VERY light drafting game. The active player draws a hand of cards to begin with, and on his/her turn, the player draws one card from the draw deck and selects on of the cards in his/her hand to play face up or face down. Playing it face up shows colors and numbers, whereby face down is a wild monotone color. 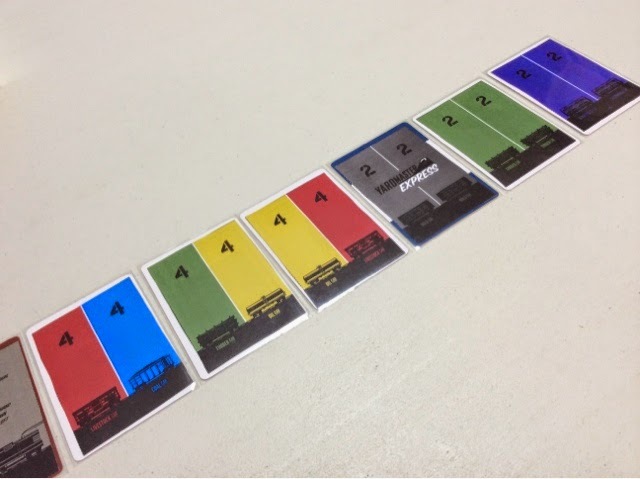 Each card the player plays must match the previous card in either color or number and this carries on till the players each play a specific number of cards from the round. Points are tallied based on the numbers showing on your tableau plus bonus points for having the longest rail of each color. And that's it! 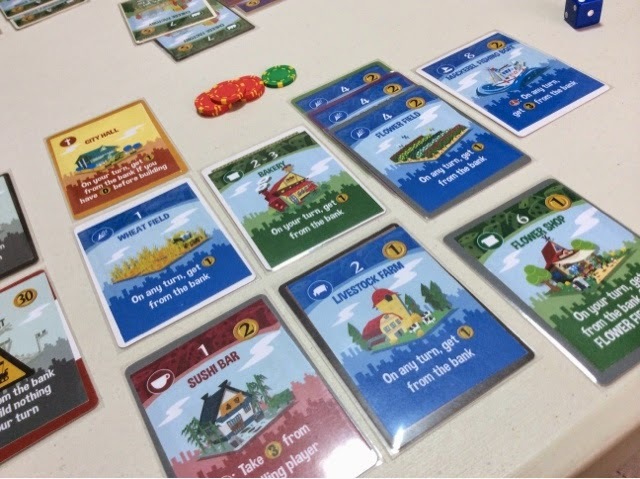 I have played machi koro multiple times before and have enjoyed my plays of it, so I was eagerly looking forward to see how much the expansion adds to the gameplay. 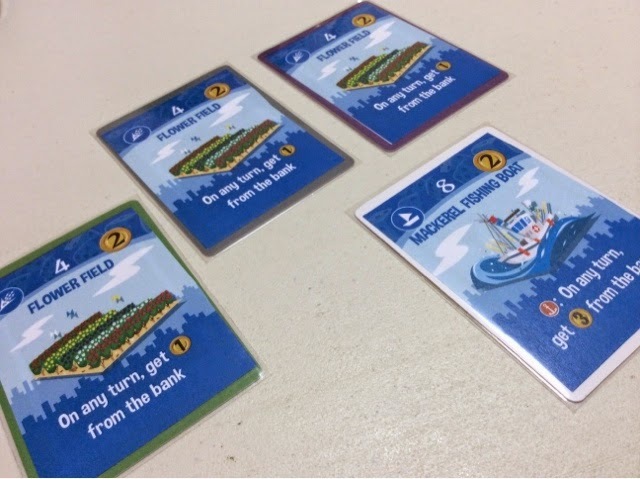 The harbor expansion adds a whole slew of new cards that each player may buy and also 2 new establishments that add to the victory conditions. One additional pre built establishment is also added that gives each player a free dollar when the player is broke and utterly penniless. The new cards use the same numbers you can find on 2 six sided dice. So they range from new cards that show number 1, number 4, number 7 etc. There is a new tuna boat card that goes from 12-14. The roll of 13 and 14 is made possible by the ability on one of the new establishments - the harbor ( add 2 to a roll of 10 or higher ). All these new cards are really interesting and add new dimensions to the game which I really like. 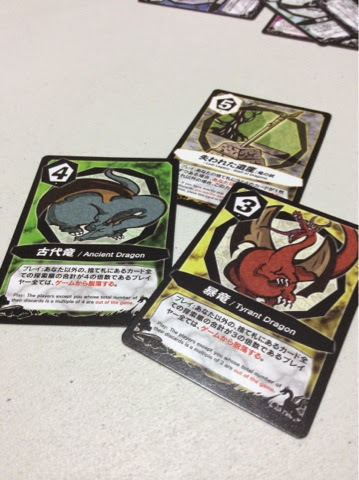 But the main new element that is added by the expansion is how the cards are distributed and available to be bought. 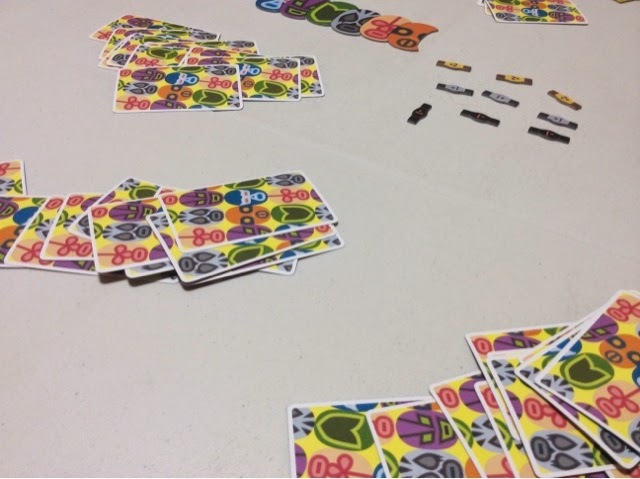 In the base game, all the cards are available on the table and nicely arranged by their number values. With the expansion, this has been greatly changed. The cards are now all shuffled together and opened one at a time till 10 different types of cards are displayed on the table. If a similar card is revealed, it gets added to the stack so that that card has multiple copies. The line of cards change only when 1 of the stacks gets bought out, then a new card is drawn till a unique building is revealed. So the cards available for purchase is randomized and unpredictable. A card you want may not come out so you have to change your plans accordingly. Does this sound fun? Well, to some yes, to me it's a big fat NO. 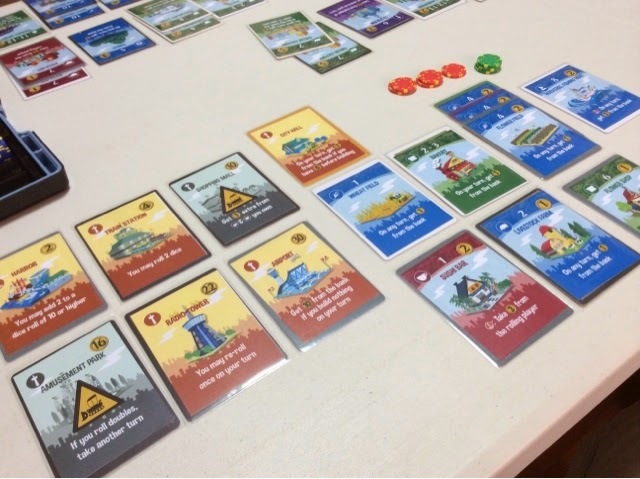 Some people say the machi koro base game is a luck fest game of dice rolling. But I disagree. Yes the dice rolls are random and unpredictable, but you can formulate a winning strategy by hedging your bets and riding some of your luck. Because each card is available for you to buy, you may plan to focus on a number type or two and try to edge out a win from there, or you may diversiy and guarantee results regardless of which numbers get rolled. But most importantly, when someone is stocking up on the red attack cards, you can buy cards to counter the effect - buying more bakeries to fend off a cafe attack for example. I love the art for the flower fields and mackerel boat. The flower fields kinda saved my game. But with the harbor expansion, the game now REALLY becomes a luck fest. Before I'm accused of being a sore loser, I won the game. So yeah, I still think it's a luck fest. With the new way that the cards are revealed, there is no way to mitigate effects from the red attacking cards. 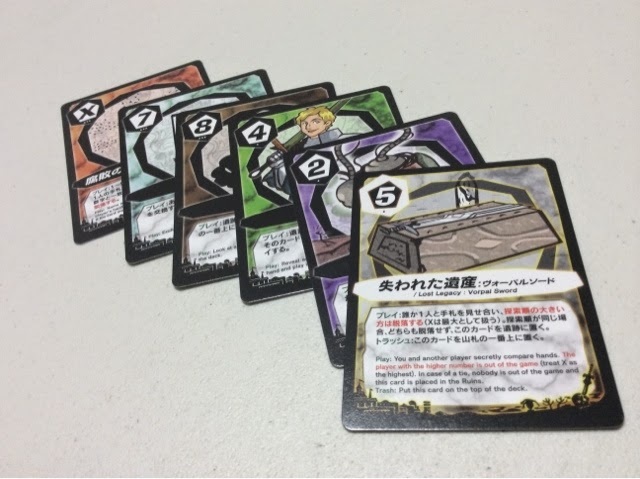 A player simply cannot find a way to avoid the negative effects except to hope that they don't roll the dreaded number, or that a card that allows them to offset the damage appears in time on the row. Also, you can't plan any strategy with the dynamic card row. I can't say I will focus on this or that, nor can I say I want to diversify or make a claim on all of one type of card, all I can do is simply buy what is available and try to combo with other cards that eventually present themselves to me. I can't save for anything I want in particular except to build my establishments. So what is left for me? Nothing. I just buy what tickles my fancy and hope for the best. In our game, Eric stocked up on the red cards and was essentially stealing money each and every turn from everyone. So how did I win? Well, there was the new establishment - the airport - that gives the player 10 coins if he/she does not buy anything. I figured that that was my best bet for quick money so I saved up for that and spammed that to victory. I got lucky by getting a few 4s that activated my triple flower fields, and that was how the game was won. The game was way longer than it needed to be with the new establishments, and that was a big bummer too. Overall, I hated the expansion. I may like it if I could just take a few buildings and make stacks with them for players to buy, so that would be a variant for the game. But out of the box, I cannot recommend the machi koro harbor expansion. In my previous report, I mentioned how I disliked the latest release from oink games - maskmen. Well, we played it again as a friend wanted to learn how the game is played. I was ok to give it a second chance to change my mind so off we went. Well, I am here to report that nothing has changed. It's a terrible game. I sit there, look at my cards, and pray for the best. Haha. You hardly have much control over anything that happens. You just play the cards that you can play on your turn, which is pretty obvious. The initial dealing of cards has so much luck involved that no matter how you try to plan, you may never be able to work around it. Just to put it out there, the friend who spent most of the game unsure of what is happening, unsure how to determine the strength of the wrestlers, won the game. Like, what the heck. If I ever play this game again, I must have lost my mind. The last small box game of the day was the second stand alone game in the Lost Legacy series - Lost Legacy: Hyakunen Senso to Ryu no Miko. I had bought this game for my friend as a present last Christmas ( including the original Lost Legacy ) but he had yet to play it till now. So we whipped it out for a go at it. For those who had forgotten, I terribly disliked my play of the original Lost Legacy. I felt the game was way too random and the investigation phase for the lost legacy felt like a farce as the ruins was constantly changing and getting shuffled that there was no way to ever deduce correctly which card may be the lost legacy. You can put 2 of the 3 cards into the ruins but after it gets shuffled it hardly means anything to you. Does the second game follow what it's predecessor does? In this second rendition of Lost Legacy, the gameplay remains mostly unchanged. You start wih one card, draw one on your turn, and play a card. If you are the last player standing you win, if the deck runs out, you go to the investigation phase to find the lost legacy. The only way the gameplay has changed is by what effects these new cards grant you. I will just get it out of the way by saying that this set of lost legacy is very very enjoyable. It removed the problem of the silly constantly shuffled ruins. None of the cards from both decks in the game allow you to shuffle the ruins. They do allow you to add cards to the ruins, but the cards are added as is, so you can see where the card you added is and which card was added by whom ( some memory involved of course ). So deduction is entirely possible and thus the game actually becomes a proper game and not some random guess fest. The card effects are also extremely cool. My favorite was the dragon set which allowed you to manipulate the cards in a player's played pile. 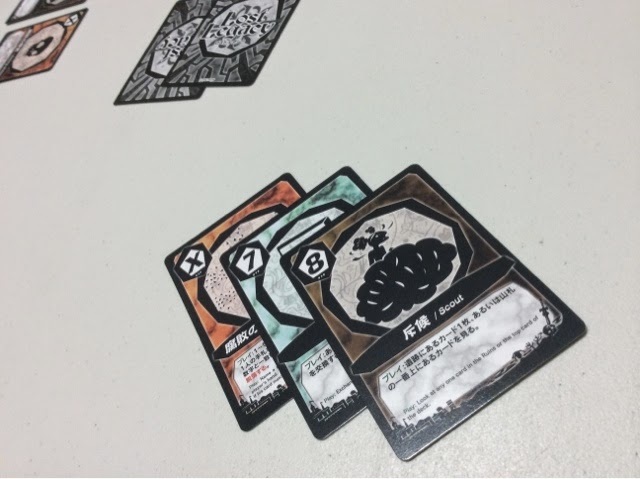 The reason for doing so is that some of the effects allow you to eliminate a player based on the total value of the cards played by a player. Some cards also have a trash ability that only take effect when the card remains in the player's played pile. So the ability to manipulate the pile is meaningful and part of a player's strategy to get ahead in the game. I felt that that was a very very nice touch. You start to take notice of what cards you want to play and what cards you should not play as well - sometimes this card may be one and the same card! I love the art for the 2 dragon cards. Wished there were more. The other set in the game - the vorpal sword - was pretty ordinary I would say. It was more about guessing what card the other players are holding and thus find a way to eliminate them. Simple but not very groundbreaking. But still, this second rendition of lost legacy has reinstilled my faith in this franchise. The game was surprisingly enjoyable and has made me consider if I should get a copy to add to my collection. Haha. Of all the small light games played on Saturday, this was the only one that hit the spot and brought a smile to my face. The rest were utterly horrendous. Eric: Well, one man's poison is another man's meat. Maybe his taste in games are inversely proportional to mine. So if I hated it... He might love it!